It’s funny how certain people’s opinions of albums we haven’t heard taint our own, and it’s also funny how the notion of something being “weird” is perceived as a bad thing. Of course, there’s “weird” and “too weird.” P.J. Harvey certainly doesn’t have a history of making music that’s mainstream or normal in the least, so the notion of an album of hers being “weird” sounds pretty on-track. Those forty minutes and twelve tracks are certainly up for discussion, but few can argue that Let England Shake isn’t remarkably different from all of P.J.’s previous albums. Recorded in a 19th century church in Dorset, South West England, on a cliff-top overlooking the sea, the album includes a cast of musicians such as long-standing allies Flood, John Parish, and Mick Harvey. The album is a highly creative one with very serious underlying tones of the death and destruction caused by war, particularly upon nature. In an interview aired on NME.com last February, P.J. remarked that this “cycle of conflict,” which has continued to exist since the time of World War I, contributes to complex feelings of love, hate, and disappointment towards one’s motherland. 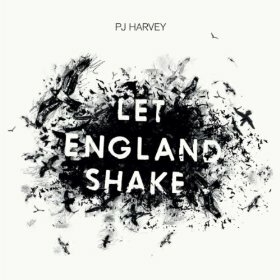 Since the release of Let England Shake, P.J. has collaborated with photographer Seamus Murphy (whose photographs of the war in Afghanistan have appeared in GlobalPost) to produce twelve short films to accompany the songs on the album. This video series has run, in part, on Newsweek and garnered rave reviews. By immersing herself in the subject of war in the Middle East, P.J. had to look outward in order to look more inward. Thus, she reemerged from this with an album musically influenced by sounds and feelings from the war and the Middle East. Overall, the mood can be described as solemn – at times eerie and unfamiliar, too, yet the album is also a melodic and fairly danceable one. The song “The Last Living Rose,” one of the strongest on the album, is a frustrated and passionate plea for a return to “beautiful England.” “The Glorious Land” begins unexpectedly with a trumpet call from the battlefield and has a psychedelic quality. Another favorite from the album is the song, “England,” because it is simply P.J. with her guitar, with the occasional blending with the words of an Afghani woman. There’s no question that Let England Shake is different; it is eerier and less guitar-driven than some of P.J.’s greatest songs, but it is also worldlier and thought-provoking. Clearly, the album is a socially responsible body of work that represents a new direction for Polly Jean, an artist who continues to intrigue and inspire.